UMBC is a community that gives. Nearly each day in the breezeway next to The Commons, one might stroll by multiple tables occupied by students raising money for this charity or that. Our faculty and staff give annually in support of UMBC and organizations supported through the Maryland Charities Campaign. 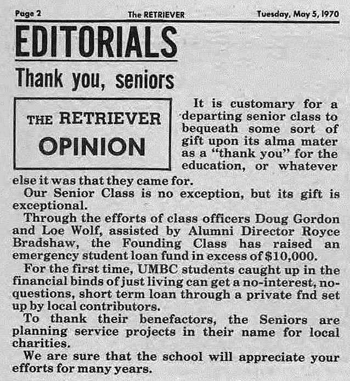 And, of course, alumni dedication to UMBC spans decades — starting with the first graduating class, in fact. The first senior project that I can locate in UMBC’s history is from 1970. The class of 1970 is often referred to as the Founding Class, because the graduates were the first group to complete all four years of their degree at UMBC. As in the origin stories of many of our campus traditions, UMBC students decided to forge their own path. During the Spring 1970 semester, a group of seniors organized to collect donations from the UMBC community as well as area businesses. 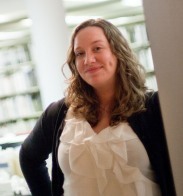 Their goal was to establish a campus fund to assist students that were having trouble paying their full tuition bill. According to the 1970 edition of Skipjack, the early UMBC student yearbook, the final total collected was $13,000, which is equivalent to more $75,000 today! For in-state students in 1970, a year of tuition at UMBC cost just $506, so a $13,000 emergency fund would have helped quite a few of them continue taking classes and working toward their degrees. We’re so happy to see the celebration of student philanthropy on the Breaking Ground site not only because it was a truly generous moment shared by the Class of 1970, but because it signifies a spirit of giving that continues to live in our current students. And, it serves as an excellent segue to a new initiative that will be launched soon to help current students use the most modern online techniques to raise money for UMBC-based projects. Stay tuned for more on that! Meanwhile, please enjoy Lindsey’s full post here.